Daylight, a powerful ally for our health! Have you had the experience of spending several hours or even days in a windowless room, with no access to daylight and only artificial lighting? Have you already experienced flying to the other side of the world and suffering the effects of the infamous Jet-Lag? If so, how did you feel? Very recently, one of my colleagues told me about her latest business trip to Asia, where she spent an entire week attending meetings in a windowless room. ”In addition to the fatigue and sleep problems related to the time shift, I had a strange feeling of malaise. At noon, when it was lunchtime, I didn’t really know whether I was hungry or not, my body wasn’t sending me the right signals any more, I had lost my bearings,” she told me. Migraines, fatigue, feeling sleepy during the day, insomnia at night, depression, etc. All these symptoms reported above are not the product of our imagination, but can effectively be linked to the lack or absence of natural light. In fact, natural sunlight, in addition to illuminating the world and letting us see what’s around us, plays a much more important role: it is essential to our health! Many biological functions, such as sleep, memory, alertness and even humor, depend on our daily exposure to natural light. So what is the scientific explanation behind it? You surely remember (or maybe you don’t?) your high school science lesson on human vision? About the two types of photoreceptors in the retina, cones and rods, with the former used to see colors and the latter to capture light? And now you find out that they didn’t tell you everything! There’s a third type of photoreceptor in the eye, called “intrinsically photosensitive retinal ganglion cells” or ipRGCs1, which are also sensitive to light, and especially blue light (I’ll come back to that in a later article), but whose function has nothing to do with vision. When they detect light, these ganglion cells communicate directly with our brains, and especially with our biological clocks. 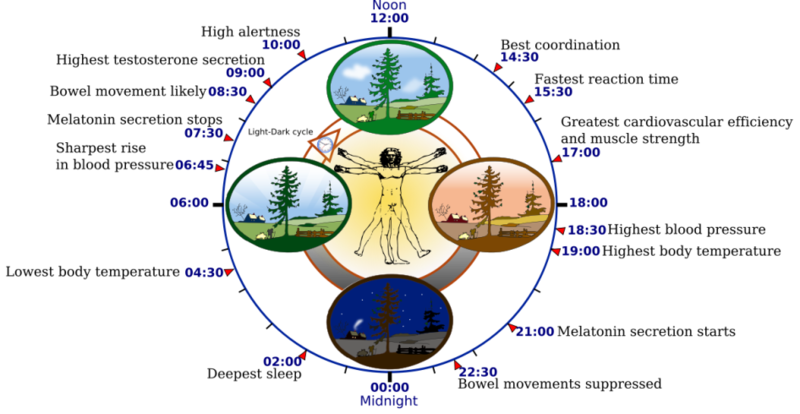 This internal clock controls many physiological activities, such as body temperature, blood pressure, hormone production (including melatonin and cortisol, which directly affect our sleep), and many others, all following a circadian rhythm of approximately 24-hour cycles. Our internal clock needs to be reset to local time every day, and this is done by means of external signals like daylight (and more precisely the alternation between day and night)2. Without this daily reset, our biological rhythms become desynchronized and disrupted, leading to short- and long-term harmful effects on our mental health (stress, depression, insomnia, fatigue, difficulty concentrating, etc.) and physical health (gastrointestinal disorders, cardiovascular problems, diabetes, cancers, etc.)3. These symptoms can be observed in people deprived of natural sunlight for a certain length of time, whose internal clocks are out of sync with the day-night cycle. This is the case, for example, with my colleague and our members of the Twittersphere. 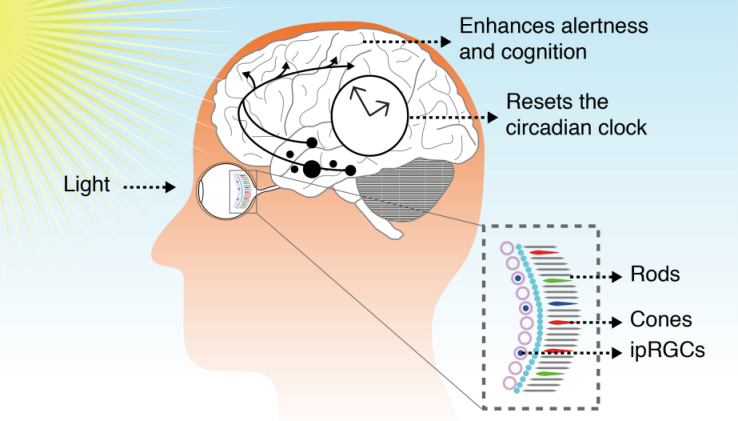 In addition to its influence on our biological rhythms, light may also have direct stimulating effects on our alertness and cognitive performance4, also through the ipRGCs. If you’re wondering why you’ve never heard of this third type of photoreceptors, it’s no doubt due less to their unpronounceable name than to the fact that their existence wasn’t discovered until 2002, and that there are still some things we don’t know about the mechanisms generating their so-called “non-visual” effects. Although we know with certainty today that the intensity and spectral composition of the light, the time and duration of exposure, and the history of prior exposure to light are key parameters5, the mystery is still far from being solved. A soon-to-be global public health issue? 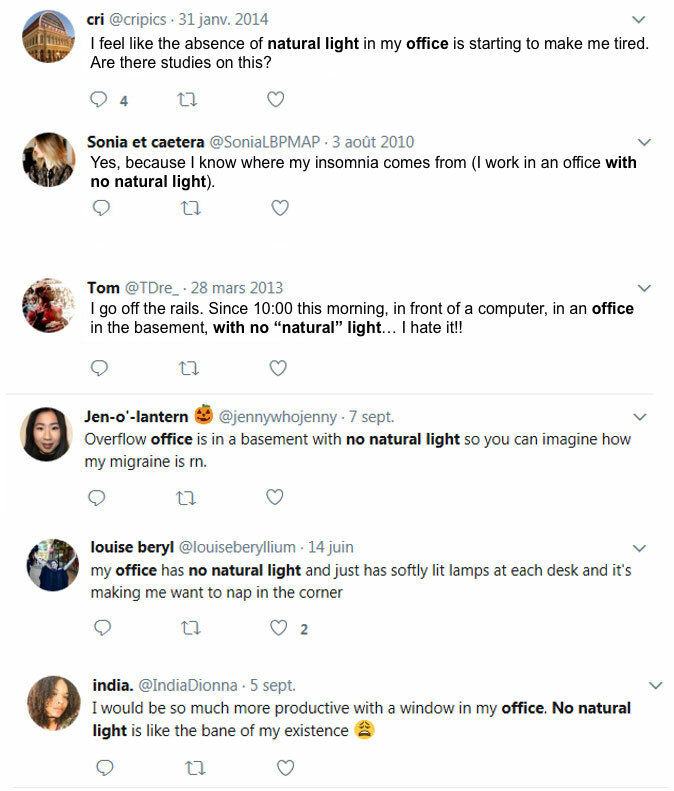 So, in a society where we spend most of our time indoors and are more and more exposed to various sources of artificial light (lamps, screens, etc.) at any time of the day or night, how do we ensure that each of us gets the “right” dose of light, at the “right” times, to remain in good health? Although several research studies have been conducted to date, the recommendations and standards are still only preliminary. Many studies are still in progress, trying to resolve this complex equation. The subject has come to involve an ever more varied panel of disciplines such as biology, psychology, the neurosciences, and also architecture and engineering. What should we do while we wait for answers? While we wait, let’s remember that although the benefits of natural sunlight have already been observed for a long time6, the recent discovery of the underlying biological causes has demonstrated more than ever the importance of integrating natural light into building design. Of course, this should be done intelligently so as not to create other potential sources of discomfort (overheating, glare), and for this reason today there are guidelines and a wide range of special products and solutions. Modeling tools can also be of value in optimizing architectural choices. All of these topics will be the subject of future blogs. In addition, since we are the occupants of buildings, whether or not we are lucky enough to live or work in areas with natural light, we must always give ourselves one or several escapes to the outside during the day, and especially in the morning, in order to reset our internal clock to local time, and also to top off our vitamin D levels when the weather permits! We should also try to limit our exposure to screens as much as possible in the evening before going to bed, so as not to delay the arrival of Morpheus for too long. Finally, if all that isn’t enough, adding luminotherapy can also be considered. Note: this article is intended to give you an introduction to the links between natural light and health, and is the first in a more complete series on the subject, where I will share with you the latest knowledge and research advances as well as the opinions of experts in this area.